Yuvraj Walmiki turning Khiladi of different kind! Indian men’s hockey team forward Yuvraj Walmiki may have been cold-shouldered by the Indian hockey selectors given the umpteen occasions when he has been recalled and dropped from the national side. 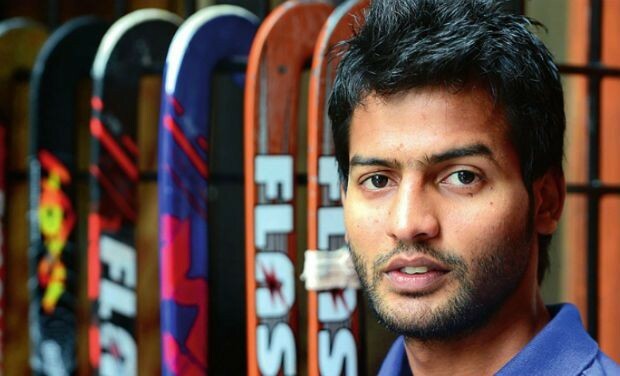 The 25-year-old, who last played for India in the Hockey World League Semifinal Round in Belgium and even score in one game alongside his younger brother Devinder, has something to gloat about on the professional front. The nippy forward, who is employed with Indian Railways, has inked a lucrative contract to feature in the popular reality show Khatron Ke Khiladi which will be aired on Colors channel early next year. Undoubtedly, the Mumbai lad is excited about his latest assignment. “Till now we used to see cricketers appear in reality shows and I think it is the first time that an Indian hockey player is getting a chance to appear in a reality show, and since the show is Khatron Ke Khiladi it doesn’t get any bigger than this. Hockey players are more known by sports journalists and officials and not by people not connected with hockey, but through this show I’m sure a lot of people from outside hockey space will know about me,” gushes Yuvraj in an informal chat. The out-of-favour Indian striker is excited about the fact that the new show has a new host in Arjun Kapoor, who replaces Rohit Shetty, who took charge in the last show held in South Africa. “Of course, Arjun Kapoor is the new host for the show and this time the show will be shot in Argentina. I’m a big fan of Arjun Kapoor and it was really great to interact with him during the show unveiling function in Mumbai recently,” he says. Yuvraj will competing in the rugged reality show alongside popular anchor Jay Bhanushali, his wife Mahhi Vij, actors Sidharth Shukla, Tanishaa Mukerji, Sana Saeed, Himmanshoo Malhotra, Aishwarya Sakhuja, Tina Dutta, Vivan Bhatena , Jhalak Dikhhla Jaa Reloaded winner Faisal Khan and dancing stalwarts Mukti Mohan and Raghav Juyal . “Rubbing shoulders with thirteen celebrity contestants will be fun no doubt. I have already become good friends with Tina Dutta, Jay Bhanushali and his wife Mahhi Vij. I’m sure I will befriend more contestants once we land in Argentina for the show,” Yuvraj quips. So for now, hockey will take a backseat for Yuvraj at least until the 2016 Hero Hockey India League to be held early next year. “I’m not in the national team now and it makes sense to do something that keeps me excited. I hope to use this time nicely and later get ready for the 2016 HIL and hopefully make it to the team for the 2016 Rio Olympics,” he signs off. The shooting for the show is expected to begin in early November.